Digital grand pianos are beautifully distinctive instruments that offer you all the features and functions that a serious piano player may be looking for. These pianos are ideal for people who want to experience all the qualities and grace that a grand piano can offer whereas they get to enjoy the benefits that a digital instrument has. Reduced cost, low maintenance, a range of features and much more is there for piano learners and experts to explore with the purchase of this type of piano. 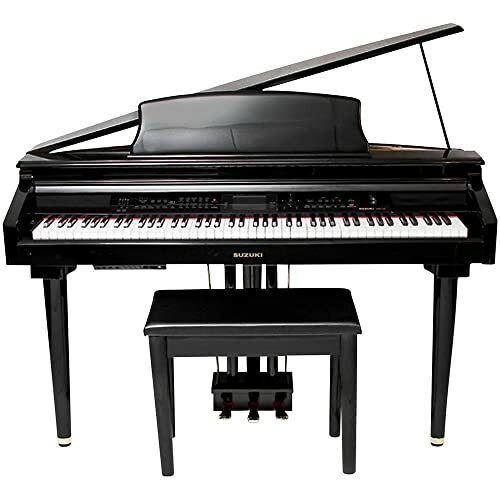 These instruments give you realistic feel and thus is the second best option for pianists after a grand piano. You get all the variety with this type of pianos so that you can choose one that falls well under your budget and suits your preferences and taste. What to look for when buying a digital grand piano? Now before you actually opt for any piano, it is essential to understand some basic differences between two most popular types of pianos including grand and upright pianos. Understanding details of each of these types would aid you in making a favorable purchase decision. Beautifully crafted with elegant design and an affordable price tag is the Williams Symphony Grand that offers one of the best experiences for pianists when it comes to playing anything other than an acoustic grand piano. 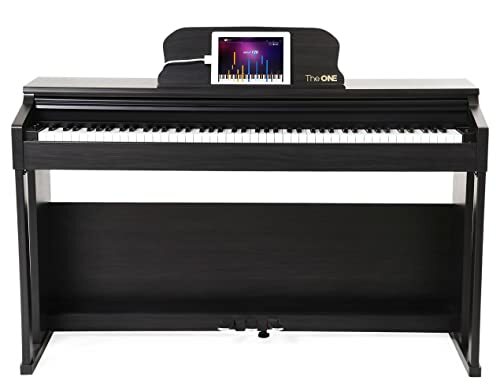 This digital piano features a micro-grand full 88 key graded hammer action keyboard designed to offer you feel, response and sound as close to a grand piano as possible. The look and attractiveness of this piano is amplified further with anebony glossy finishthat presents it as a beautiful furniture piece. Highly defined custom sound library is an added perk with this piano as it features high resolution sampling from Italian grand, vintage electric pianos and organs. Apart from that it includes 174 voices, 128 MIDI sounds and varied other sounds to give you more dynamics for practice and performances. You will also get realistic effects of a grand piano like adjustable pedal noise, sustain layer, key noise, resonance and other effects. USB, MIDI and Bluetooth support makes data transfer much easier. Other features include 120 real time playback styles, 2 track recorder, headphones and stereo out jacks, transpose, metronome, clear LCD and split/layer features makes it comparable to any high-end expensive piano. Moreover it aids learning with its Song Tutor that offers you three different types of songs including rock, classical and blues. It further offers a large collection of online music and cloud based education for students for advanced level training partnered with McCarthy Music. 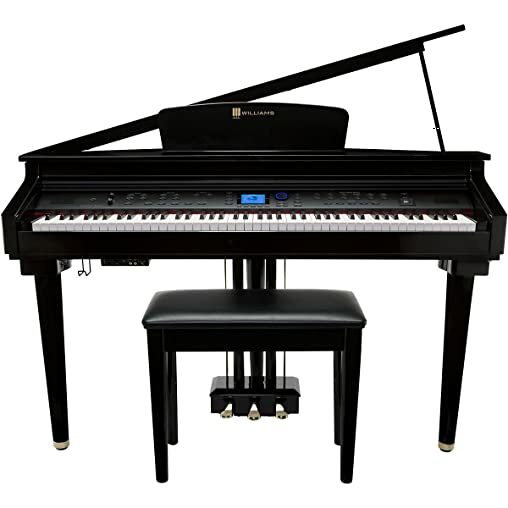 This best digital grand piano comes with a stylish and comfortable matching bench. Though a digital grand offers feel and look of a grand piano but it comes with a reduced price tag (though still expensive) and a smaller foot print in comparison. But all of these pianos are not similar and thus it is important to have a look at some essential factors and features when considering to buy one. Size: When we talk about a grand piano, you will be able to find a full size as well as mini ones too. So space consumption can be an important concern when you are planning to buy an instrument. If space is not an issue, you can opt for a full grand digital instrument whereas if you have restricted space you can still find some beautiful instruments of this piano category. Varied sizes are available and they differ from each model of varied brands. Cost: Though the price of a digital grand would not be really cheap but in comparison to its acoustic counterpart, it would be much less. However you need to be careful that a higher priced digital grand may not surely be of better quality in comparison to some instrument that has low price tag. Material and Durable Construction: As you will not be purchasing or replacing your piano quite often because of its high price tag, you must look for a material and construction that is durable and would last for years. A high quality wooden or fiberglass construction is idealistic with high quality key bed. Whereas in your search for this instrument, you will find some cheaper low priced plastic mix construction that may need some replacements sooner over use. Moreover consider replacement cost too. This you can determine with the type of material used and check if replacement of certain parts such as keys would be affordable. Keyboard: Another important consideration that serious piano players need to make before buying one is to check whether the piano has a full realistic keyboard or not. It means that keys should have some realistic touch and feel action. Sensitivity, responsiveness of keys and weighted hammer action is something that piano players should look for in order to effectively learn, practice and perform. Sound and Voice: One important factor to look for is to see if your grand digital piano is offering realistic sound and tonal quality as you can board with an acoustic real piano. Most of the digital instruments have built-in technology and realisticsampling that gives accurate sounds, tones and voices and buyer should look for such instruments. Connectivity: Varied level of connectivity features are offered with various brands and models of pianos. Some may offer USB, MIDI, AUX Inputs/Outputs along with headphone jacks. So consider one that fits your needs. Look: This factor however is not crucial but when you have planned to buy a grand digital instrument, you would not be trying to store it every time after use. This would not be really possible and thus you should look for something that may shine out in your room as an attractive centerpiece and not something dull, boring or worn out. So you may also consider an attractive piece that would go well with your interior as you place it at a prominent location in any of your rooms. So a mix of features, functionality, quality and look will result in a right choice! Digital Grand Pianos are not much different from digital pianos when it comes to taking care and maintenance. Similar to digital pianos they do not need regular tuning and thus are less hassle to take care of. Despite of the fact, there are several things that you should be worrying about each day if you want your instrument to work well for long in good condition. While placing your piano in first place, think of a location that is complete safe for it. Avoid keeping it in a place where it gets exposed to direct sunlight. Too much of heat is not safe for piano too. Take care of this instrument as it is placed in your room. Don’t just let spills and food crumbs fall over it. Avoid drinking or eating anything while using your piano. Moreover it is important to clean dirt and debris from keys on a regular basis. But do not dust it just like you dust your sofa or other furniture. This one is a sensitive piece and any kind of bumps can damage it. When cleaning always use a dry clean cloth and avoid any exposure to water. For more details on cleaning you should first refer to instruction manual of your instrument. Some care must be taken while using this piano. Make sure that the outlet you will be using to plug in your instrument is in proper condition. When not in use, unplug the piano. When unplugging, make sure that you have turned it off. Keep an eye on chords, keys and other parts of your instrument and if you notice any damage, arrange for replacement. Avoid using piano when any of its part is damaged. If replacement or repair is under warranty, send the instrument to manufacturer. Don’t try your hands over any kind of repair for your piano. Always call a professional piano technician and expert for repair and maintenance. Your grand piano is not really simple to move and it would need some amount of efforts and planning to move it safely. Safety is the prime concern when you are dealing with transferring this expensive piece. So here are some tips to help you with that task. You may need help of a professional mover but if you intend to do it completely by yourself, you will need some more hands in order to move risk-free. Take a note of measurement of your digital grand before actually moving it to a new place and make sure that the place you are intended it to move to is a right fit in terms of space. Define a route on how you are going to move with piano to its new position? Have appropriate tools with you which may include furniture pads, gloves, plastic covers etc. In order to keep your piano from scratching and other damage, wrap it well with plastic or other suitable blanket covers. Keeping your flooring and furniture also safe and as you transfer your piano to a new place, use floor pads to keep your surface protected. Wear gloves in order to avoid slipping of piano with moisture on your hands. An advantage with a digital grand is that you don’t need to worry about stressing piano and damaging it to an extent that piano goes out of tune. A digital grand doesn’t need tuning and thus there is not much risk when moving to sound, voices and tone of these pianos. Move your piano endways only and not from sides. Don’t try to hurry, carefully moving piano would take some amount of time. The digital grand pianos have gained huge popularity among piano learners and players who are really serious. They wish to learn and play with a touch, response and sound system similar to an acoustic grand piano but due to cost, space, maintenance or any other constraint could not opt for a grand piano. These pianos are suitable solution for all such pianists. With a detailed look on what you can expect from these pianos you will be able to have a better look when considering a particular brand or model of digital grand.